How my disk defragmenter led me to find and delete millions of unwanted files cluttering up my hard disk! 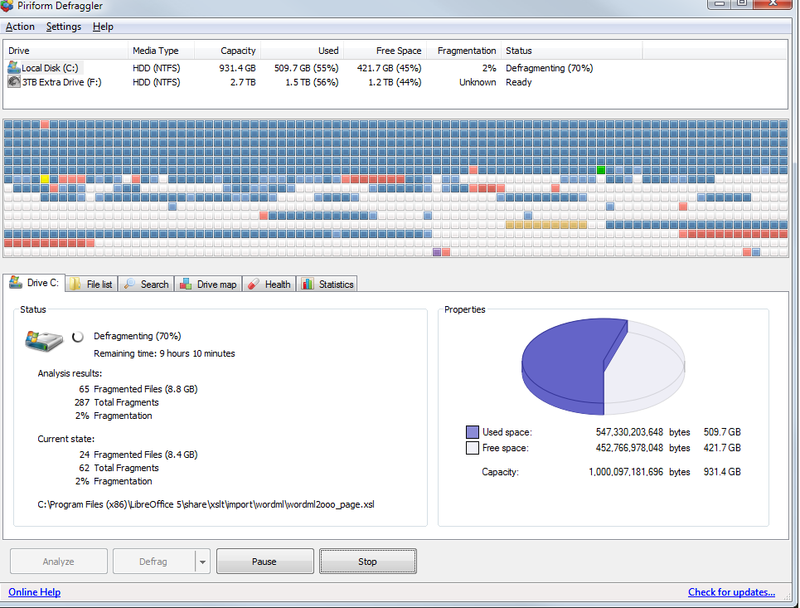 I’ve spent the last three weeks defragmenting my hard disk. Yes, really! And along the way I’ve discovered that I had several million useless files clogging up the disk in hard-to-find, difficult-to-delete subdirectories. It all started when I decided to move all the programs and files I use most often onto a new PC and leave my old PC free for testing and reviewing software. It seemed to go pretty well until I decided to defragment my old PC’s hard disk. The PC’s startup time had been getting slower and slower over the years. Defragmentation was just one of the measures I took to speed it up. I first tried using the standard Windows defragmenter (right-click the disk drive in Windows Explorer, then select Properties/Tools/Defragment now). That was not only horribly slow but, to make matters worse, it provided very little feedback to show what, if anything, was being defragmented. Windows Defragmenter - it does the job but is far from informative! So I tried out Piriform’s free Defraggler https://www.piriform.com/defraggler instead. This wasn’t exactly quick either but at least it showed me what it was doing. It displays a colour-coded representation of your disk, showing fragmented files, unfragmented files, when data is being read and when data is being written. It also shows a list of fragmented files and you can optionally defragment selected files. The only trouble was that Defraggler got stuck in the initial analysis stage of defragmentation. It showed it had analysed 100% of my disk and then just stayed there, constantly busy, but continuing to show 100%. I suspected that it was stuck analysing a specific set of problematic files, but I didn’t know which ones. Clearly I needed to know which files were taking up most of my disk space. Defraggler - a free tool that shows you what it's doing! The rather good free disk mapping too, TreeSize, https://www.jam-software.com/treesize_free/ helped out here. This draws a map of your disk sorted by the directories containing either the largest amount of data or the largest number of files. It took quite a while to finish and I was prompted a few times to ask if I wanted to abort. But I stuck with it and eventually it showed me exactly what was causing all my problems. The folder c:\Windows\sysWOW64\config\systemprofile\AppData\Local\Microsoft\Windows\Temporary Internet Files\Content.IE5 contained over 11,000,000 files (yes, I really do mean eleven million!) while c:\Windows\system32\config\systemprofile\AppData\Local\Microsoft\Windows\Temporary Internet Files\Content.IE5 contained another three million. Where the heck did they come from? OK, so maybe my problem is pretty obscure. But it illustrates a more general problem when doing disk intensive operations such as backups and defrags. Namely: the more files you have, the longer the backup or defrag takes. And millions of files, as I had, can really slow things down. The obvious solution is to delete them. But how? Anyway, it took me about three days (night and day) to delete those files. Once I’d done that I ran Defraggler again and this time it got on with the job pretty effectively. Along the way, I discovered a whole load of other directories containing unneeded junk. For example, some programs which I had long ago uninstalled, had left all kinds of stuff under \ProgramData. I duly removed them. I’m not providing any details, however, since some apparently unneeded files under \ProgramData and other ‘system’ folders may be important and I don’t want to be blamed for encouraging you to delete anything that may cause problems. When you go hacking around in these directories you are on your own! But if, like me, you are frustrated by the slow speed of your defragging or disk backup programs, you may want to take a look, using TreeSize, to see if your disk space is being taken up by junk you didn’t know about. You’ll almost certainly find that it is! If you’ve used VEGAS before, the first thing you’ll notice when you load the new version is that it looks nicer. I’ve criticized VEGAS before for its rather inelegant and screen-hogging user interface so I am pleased to see that version 15 gets rid of some of the unnecessary clutter. For a general overview of VEGAS see my previous review of VEGAS 14. The user interface has redesigned icons, full-colour timeline tracks and the addition of four switchable colour schemes. As in previous releases, you can tailor some elements to taste – for example, by selecting alternative track colours. A new feature lets you switch the overall colour scheme of the entire user interface from a choice of four: Dark, Medium, Light or White. However, there is no way of previewing the colour-scheme change when you make it. Any change you make is only applied after you restart VEAGAS which, let’s be frank, is hardly the final word in user-friendliness! In an attempt to reduce clutter, some new context-sensitive menu configuration tools (called, ‘hamburger’ buttons) have been added. 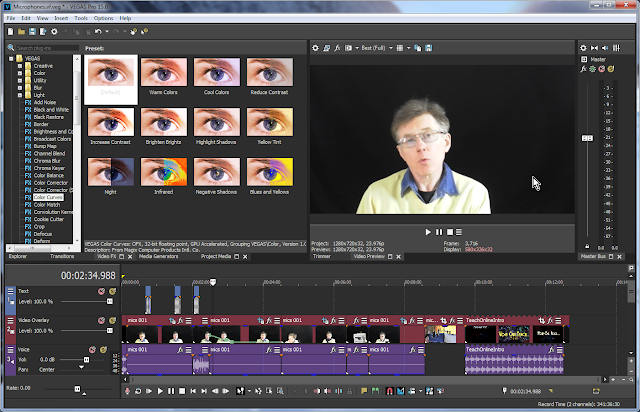 These buttons are shown as three horizontal lines which appear on various UI elements such as the video preview window, the track panel and also in the top right-hand corner of individual video and audio clips. When you click the hamburger button a drop-down menu appears from which you can select various options. For instance, in the video preview window the hamburger menu shows items to go to the next or previous frame, to the start or to the end. In the track pane, it pops down a cascading menu to let you track motion, bypass motion blur, select a compositing mode and various other arcane options. If you decide that you need these features frequently and want a faster way of getting at them you can add them as icons to the window or tool itself. Hamburger buttons have been around for a while – they are often used in mobile apps and web sites to hide functionality and keep the interface ‘clean’. Some users hate them. I have to say, though, that the way they are used in VEGAS (to hide less frequently used options or configure the selected track or window) they seem to me to be a reasonable way of keeping the user interface under control. You can also rearrange the windows and the pages on tabbed panes by dragging them and dropping them into selected areas of the workspace. To redock an undocked pane you have to hold CTRL while dragging. Once you’ve created a layout you like you can save it by name or you can select from one of the redefined layouts – this is just as well as I found that it takes quite a bit of trial and error to redock tabbed panes in exactly the place you want (I kept accidentally messing up the layout in my attempts) once they’ve been undocked! But never mind the appearance, what about new and improved functionality? Top of my personal list of desirable features would be increased rendering speed, so I was pleased to see that this is one of VEGAS 15’s claimed improvements. There is no simple way to benchmark the speed of video rendering. The size and format of the project media, the overhead due to any editing and effects that have been added, plus the rendering varying efficiency of different production settings and the specifics of your computer hardware setup all have an impact. Even so, I decided to run a very simple test to get some idea of the speed of video rendering. I ran this test on a PC with 16Gb of system memory and a NVIDIA GTX 980Ti graphics card with 6 Gb of video memory. I tried rendering a single 5 minute 25fps 1920x1080 video clip, with no editing applied. I enabled the NVIDIA GTX GPU acceleration using the VEGAS Preferences dialog. In VEGAS 14 I rendered as Mainconcept AVC/AAC H.264 MP4 at the original video size (1080p). 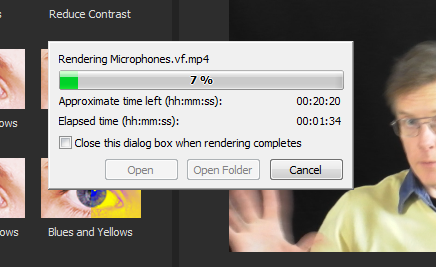 It took 8 minutes and 52 seconds to render. With VEGAS 15 the same clip was rendered with MAGIX AVC/AAC MP4 (the replacement for the Mainconcept format). It took 8 minutes and 10 seconds to render. So, in short, not much difference. For the sake of comparison, I rendered the exact same clip in Cyberlink PowerDirector 15 (AVC H.264 MP4, 25fps, 1080p with its hardware video encoder enabled) and the entire video was rendered in 31 seconds. Yes, really! More than 7 and a half minutes faster than VEGAS 15. All I can say for sure is that, in long experience of video editing and producing, Cyberlink PowerDirector has by far the fastest video rendering of any program I’ve ever used. VEGAS 15 doesn’t, as far as I can see, offer any real challenge in this respect. One thing I do like is the new interactive sizing and cropping of video clips. Both Picture-in-Picture and Crop editing have been improved so that you can, for example, modify the size and position of a video clip that overlays another clip. For instance, if you have a video clip showing some scenery or a tutorial of some sort and you want to overlay a ‘talking head’ clip, you just drop the overlaid clip onto a new track and apply the ‘picture in picture’ plugin to it. 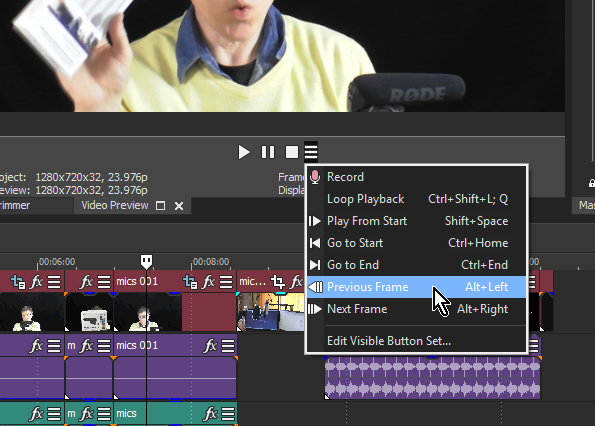 This now lets you move and resize the overlaid clip right inside the video preview window. You can, of course, achieve the same results by panning and cropping the overlaid clip as in earlier VEGAS releases. But traditional VEGAS pan/crop has to be applied in a popup dialog so the new interactive PIP tools add an extra level of convenience. The Crop plugin works in a similar way. You start by dropping Crop from a list of plugins onto a video track. In order to do the actual cropping you have to pop up the Crop dialog box and then you can either make adjustments using sliders or you can drag the edges of the video clip in the preview window. There are numerous other enhancements to tools throughout this release. These include the ability to selectively paste event attributes’ (such as an audio pitch shift, transitions or pans and crops) from one clip to another. 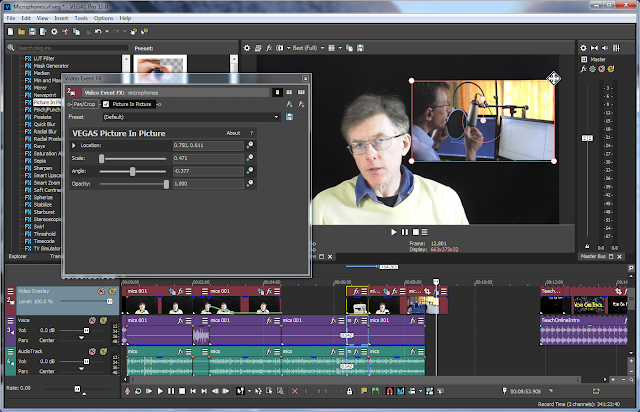 And you can automate video rendering and uploading to YouTube, Facebook or Vimeo. In summary, this release of VEGAS has some useful improvements both to functionality and interactivity. But it has both the strengths and the weaknesses of earlier versions. Its ability to chain together multiple effects, for example, and tweak individual parameters in the ‘effects chain’ provides a high level of editing control but the downside is that this means that you have to do a lot of work in popup dialog boxes which can be quite fiddly and time-consuming. And its video rendering speed may have been improved a bit but it is still far from being a speed-demon. So if you need precise editing control and don’t mind the extra time it takes to edit and render, VEGAS has a lot to offer. But if you just want to get a whole load of videos edited and uploaded as rapidly as possible, VEGAS may not be the best choice.